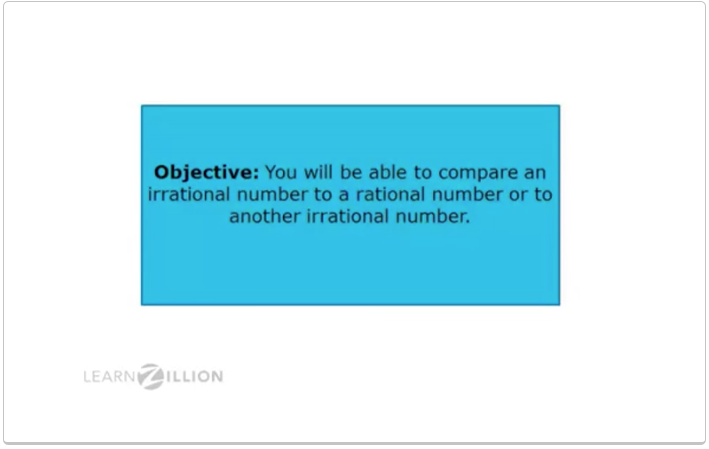 8.NS.2 - Approximating Irrational Numbers - Use rational approximations of irrational numbers to compare the size of irrational numbers, locate them approximately on a number line diagram, and estimate the value of expressions (e.g., π2). For example, by truncating the decimal expansion of √2, show that √2 is between 1 and 2, then between 1.4 and 1.5, and explain how to continue on to get better approximations. A square is you take a number and multiply it by itself. A visual representation would be that you are making a square that is comprised of many smaller squares. As you can see on the left side of the top image, when you square a value, you have a base with an exponent of 2. This means that you take the base and make a square with sides that long. Looking again at the top image, you can see on the bottom we have 5 with an exponent of 2. This means we make a square that is 5 x 5. When you multiply 5x5 you get 25, which means that you need to have 25 "little squares." This means that 5 squared is equal to 25. 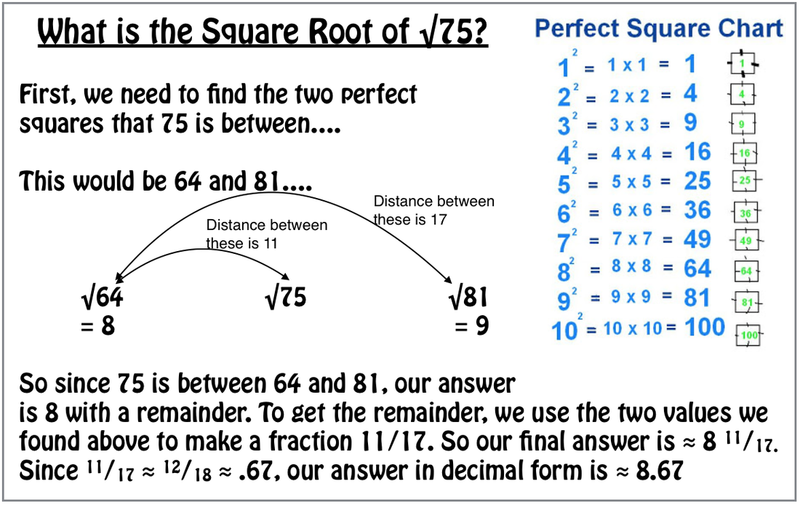 A square root is the "inverse operation" of squaring. In other words, it "undoes" a square. 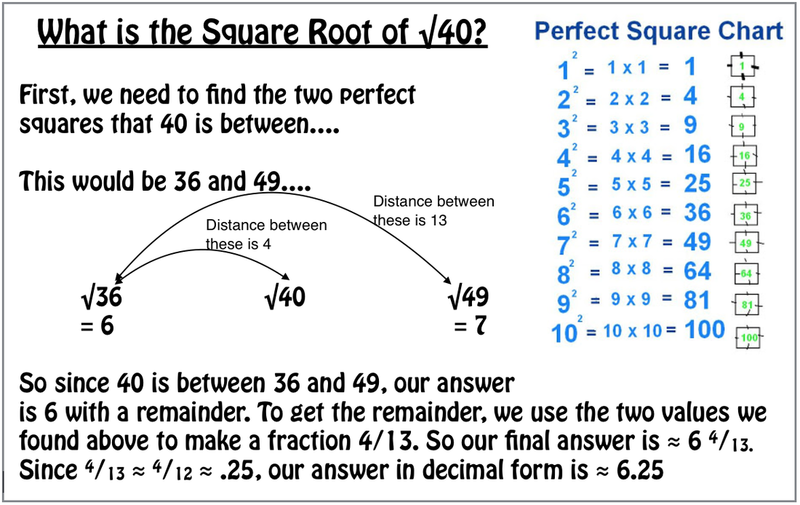 As you can see on the right side of the top image, you put a value "under" the √ symbol in order to take the square root. Let's look at the bottom square root. You have √25. This means that I need to take 25 "little blocks" and try to make them into a perfect square. We can do this by making a square that has size that are 5 each. This is because we can divide 25 into 5 equal rows that are 5 long. Therefore, this tells us the square root of 25 is 5. It's not too hard to come up with a "ballpark estimate" of the value on a non-perfect square. Since it will be an irrational number, you can never get the exact answer, but we can come up with a reasonable guess. Below are two example on how to estimate the value of a non-perfect square. Can you figure out what the pattern to the right means? How does it relate to what we are talking about here?